Average insurance rates for a 2013 Toyota Corolla are $1,298 a year with full coverage. Comprehensive insurance costs around $238, collision costs $450, and liability costs $452. Buying a liability-only policy costs as little as $504 a year, with high-risk insurance costing $2,820 or more. Teenage drivers receive the highest rates at $4,998 a year or more. Rate data is compiled from all 50 U.S. states and averaged for all 2013 Toyota Corolla models. Rates are based on a 40-year-old male driver, $500 comprehensive and collision deductibles, and a clean driving record. Remaining premium consists of UM/UIM coverage, Medical/PIP, and policy fees. For a middle-aged driver, prices range go from as low as $504 for a discount liability-only rate to the much higher price of $2,820 for a high risk driver. These differences demonstrate why everyone should compare rates for a specific zip code and risk profile, instead of making a decision based on average rates. 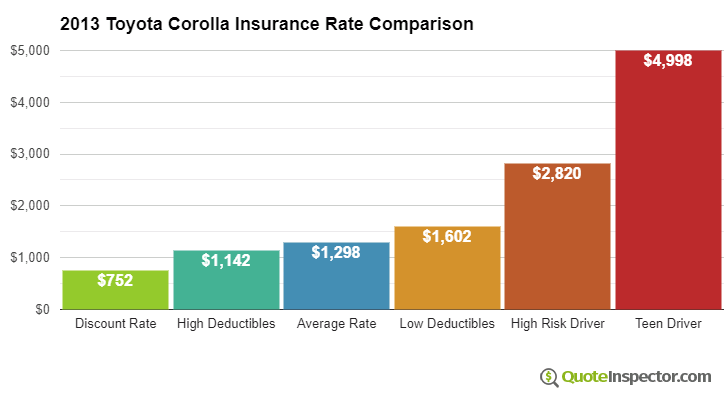 Looking for the cheapest insurance coverage rates for your Toyota Corolla? Tired of trying to scrape together enough money to buy car insurance? You are in the same boat as many other drivers. With so many insurance companies to choose from, it can be hard to choose the most affordable insurance company. It’s a good idea to check insurance coverage prices on a regular basis since insurance rates tend to go up over time. Just because you found the lowest rates on Corolla coverage last year there may be better deals available now. Forget anything you know (or think you know) about insurance coverage because we’re going to demonstrate the fastest and easiest way to find the best coverage while lowering your premiums. Locating the cheapest protection can be fairly easy. Basically, everyone who buys car insurance will most likely be able to cut their insurance bill. But car owners must learn how the larger insurance companies price online insurance. The best way to get policy rate comparisons utilizes the fact car insurance companies allow for online access to give you rate quotes. To begin a comparison, all you need to do is give them rating details including if a SR-22 is required, how much coverage you want, if the car is leased, and your education level. Your information is then sent to multiple top-rated companies and you receive quotes instantly to find the best rate. Smart consumers have a good feel for the factors that play a part in calculating insurance rates. When you know what positively or negatively determines base rates allows you to make educated decisions that may reward you with lower insurance prices. Younger drivers pay higher rates – Teenage drivers are known to be less responsible when behind the wheel so they pay higher insurance rates. Older insureds tend to be more responsible, tend to file fewer claims and are safer drivers. Theft deterrents lower rates – Choosing a vehicle with an alarm system can get you a discount on your insurance. Anti-theft features like LoJack tracking devices, vehicle tamper alarm systems or GM’s OnStar system can thwart auto theft. More miles equals more premium – The more you drive every year the more you’ll pay to insure your vehicle. The majority of insurers apply a rate based on their usage. Cars left parked in the garage can get a lower rate compared to those used for work or business. Make sure your insurance policy shows the correct driver usage, because it can save money. Incorrect usage on your Corolla can cost quite a bit. Never allow your policy to lapse – Driving with no insurance can get your license suspended and you will pay a penalty because you let your insurance expire. And not only will insurance be more expensive, but being ticketed for driving with no insurance can result in a license revocation or jail time. Liability coverage is peace of mind – Liability coverage is the coverage that protects you in the event that you are found liable for damages caused by your negligence. Liability provides you with a defense in court which can be incredibly expensive. Liability is cheap when compared with rates for comp and collision, so drivers should carry high limits. Rural vs Urban Areas – Being located in a rural area has it’s advantages when buying insurance. Drivers who live in large cities have congested traffic and longer commutes to work. Lower population means reduced accidents and also fewer theft and vandalism claims. Properly insuring your vehicles can get expensive, but discounts can save money and there are some available that you may not even be aware of. Certain discounts will be applied at the time of purchase, but a few must be manually applied before they will apply. Low Mileage – Fewer annual miles on your Toyota can qualify you for a substantially lower rate. Student in College – Any of your kids living away from home attending college and do not have access to a covered vehicle may qualify for this discount. Clubs and Organizations – Belonging to a civic or occupational organization is a good way to get lower rates on insurance coverage on Corolla coverage. Life Insurance – Some companies give a discount if you purchase life insurance from them. Payment Method – If paying your policy premium upfront instead of making monthly payments you may reduce your total bill. Keep in mind that most discount credits are not given the whole policy. Some only reduce the price of certain insurance coverages like comp or med pay. Just because you may think you could get a free insurance coverage policy, companies don’t profit that way. But all discounts will bring down the amount you have to pay. When might I need help? When it comes to choosing adequate coverage for your personal vehicles, there really is not a “best” method to buy coverage. Everyone’s needs are different so this has to be addressed. For example, these questions might point out if your insurance needs may require specific advice. What happens if I owe more than my 2013 Toyota Corolla is worth? Should I sign the liability waiver when renting a car? If you don’t know the answers to these questions, you may need to chat with a licensed insurance agent. If you don’t have a local agent, take a second and complete this form or you can go here for a list of companies in your area. Learning about specific coverages of your policy can be of help when determining which coverages you need and proper limits and deductibles. The coverage terms in a policy can be difficult to understand and even agents have difficulty translating policy wording. Below you’ll find the usual coverages found on most insurance policies. Liability insurance provides protection from damages or injuries you inflict on a person or their property. It protects YOU from legal claims by others. It does not cover your own vehicle damage or injuries. Liability coverage has three limits: bodily injury for each person injured, bodily injury for the entire accident and a property damage limit. Your policy might show limits of 50/100/50 which means $50,000 bodily injury coverage, a limit of $100,000 in injury protection per accident, and property damage coverage for $50,000. Some companies may use a combined single limit or CSL which limits claims to one amount without having the split limit caps. Liability coverage pays for things such as loss of income, bail bonds, court costs and emergency aid. How much liability coverage do you need? That is a personal decision, but you should buy as much as you can afford. Comprehensive insurance covers damage caused by mother nature, theft, vandalism and other events. You first must pay your deductible and the remainder of the damage will be paid by comprehensive coverage. Comprehensive can pay for claims like falling objects, hitting a bird and hitting a deer. The most a insurance company will pay at claim time is the cash value of the vehicle, so if the vehicle’s value is low it’s not worth carrying full coverage. Collision coverage pays to fix your vehicle from damage caused by collision with a stationary object or other vehicle. A deductible applies and then insurance will cover the remainder. Collision insurance covers things like damaging your car on a curb, scraping a guard rail, crashing into a building and colliding with a tree. Collision is rather expensive coverage, so consider removing coverage from older vehicles. You can also increase the deductible to save money on collision insurance. This coverage protects you and your vehicle from other motorists when they are uninsured or don’t have enough coverage. This coverage pays for injuries sustained by your vehicle’s occupants and damage to your Toyota Corolla. Due to the fact that many drivers have only the minimum liability required by law, their limits can quickly be used up. For this reason, having high UM/UIM coverages is a good idea. Normally your uninsured/underinsured motorist coverages are similar to your liability insurance amounts. Cost effective 2013 Toyota Corolla insurance is possible both online and also from your neighborhood agents, so you should compare both to have the best chance of lowering rates. Some insurance companies may not provide online quoting and many times these smaller companies only sell through independent insurance agents. We just presented a lot of information how to reduce insurance prices online. It’s most important to understand that the more rate quotes you have, the higher your chance of finding lower rates. Consumers may even find the biggest savings come from an unexpected company. They can often provide lower rates in certain areas than the large multi-state companies such as Progressive or GEICO.